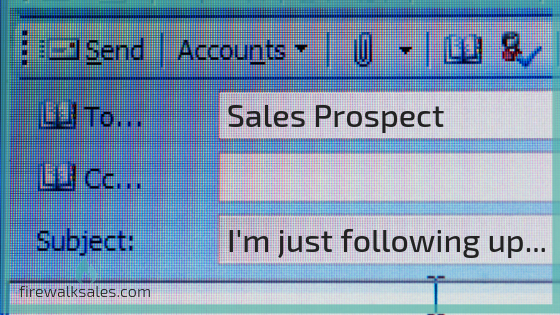 How an email starts says a lot about the true goal of the message. When the first sentence starts with “I…” there’s a pretty good chance that the objective is more meaningful for the sender than the receiver. As you read the email further, the more times the sender says I, We, My, Our, the more they are prioritizing themselves. The word “just” betrays a lack of confidence. It’s the word equivalent of knocking very quietly on a door of someone you don’t know that well yet. You’re visiting unannounced and you’re about to ask them for money. On the one hand, you need them to answer. On the other hand, you don’t really believe you have any right being there. Deep down, you’re actually a little mortified with yourself. The remaining part of the statement, “I just wanted to…” further demonstrates that it’s all about the sender. “I want” also shows up as “I would like to…” and “I would love to….”. There’s also “I hope….” And “I am hopeful that…” (See also: “just”). In a very typical email that I received this morning, the sender used versions of these phrases SEVEN times in about four paragraphs. Use “you” early and often. Make it about them. Be relevant. Do your homework and/or reference real conversations. Be confident. Go in deeply believing in your mission and value. Know it. Feel it. Connect to their priorities. If they barely know you, they probably don’t care what you want. Ultimately, all of this connects mindset, message, and method. This is what the Firewalk Sales system is all about. Need assistance crafting your next sales email? Schedule a free consultation, and let’s work on it together. Happy to help you!